NVIDIA today introduced the NVIDIA® GeForce® GTX™ 700M series of notebook GPUs, which enable gaming notebook PC designs that are smaller and more powerful than ever before. The GeForce GTX 700M series GPUs bring blistering performance, advanced gaming technology and true portability to the next generation of gaming notebooks. NVIDIA GeForce® Experience™ software, which adjusts in-game settings for the best performance and visual quality specific to a user’s notebook and automatically keeps GeForce drivers up to date. Notebook manufacturers that have committed to using GeForce GTX 700M GPUs in their designs include Acer, Asus, Clevo, Gigabyte, MSI, Razer and Toshiba. Others will be announced soon. More information about the GeForce 700M family of notebook GPUs is available at www.GeForce.com. The GeForce GTX 780M is our flagship mobile GPU, sporting 1536 CUDA Cores, up to 4GB of VRAM, a 256-bit memory bus, a 2500MHz Memory Clock, and a Base Clock of 823MHz that can Boost even higher. Combined, GTX 780M’’s changes and enhancements increase performance by 31% in comparison to the previous-generation GTX 680M. The GeForce GTX 770M is a speedy chip, packing-in 960 CUDA Cores, up to 3GB of VRAM, a 192-bit memory bus, memory clocked to 2000MHz, and a Base Clock of 823MHz. Compared to its predecessor, performance increases by a massive 55%, allowing the latest games to be played at 1920×1080 at High-to-Ultra detail levels. The GeForce GTX 760M and GeForce GTX 765M are our entry level GTX GPUs, capable of running the latest titles at high quality levels at 1920×1080, or ultra at 1600×900. These GPUs will give you the best balance of portability and power, whilst also delivering a level of visual fidelity far greater than you’’ll find on current-gen consoles. Compared to its previous-generation GTX 600M Series counterpart, the GTX 760M nets gamers a performance improvement of 30%, and with the GTX 765M that gain increases yet further. As the chart above shows, this generational improvement enables every game in our test suite to run at over 30 frames per second at 1920×1080. With generational improvements of 30-55%, performance on the new GTX 700M chips is high enough to run the very latest games at Ultra and High levels of detail, making a GTX 700M notebook a viable alternative to a desktop PC. Should you require even more performance, every GTX 700M GPU supports NVIDIA SLI configurations, increasing performance by up to 2x. Almost all big-name games have full SLI support come release thanks to our Game Ready drivers, and if not a profile will be delivered automatically through GeForce Experience’s’ update feature as soon as it’’s ready for primetime. Contributing to GTX 700M’’s sizeable performance gains is GPU Boost, a Kepler-exclusive feature that maximizes frame rates in each and every game. Before GPU Boost, performance and power usage had to be capped to prevent overly-demanding synthetic benchmarks from damaging GPUs. With GPU Boost, this problem is solved by continuously monitoring and adjusting clock speeds and voltages, allowing GPUs to use every last ounce of performance in all applications and games, without exceeding safety or comfort limits. With GPU Boost, every application and game runs at a guaranteed, minimum Base Clock speed on Kepler GPUs. If there’s extra power available a Boost Clock is enabled, increasing clock speeds until the graphics card hits its predetermined Power Target. This dynamic clock speed adjustment is controlled by GPU Boost 1.0, which monitors a whole slew of data and makes real-time changes to speeds and voltages several times per second, maximizing performance in each and every application. 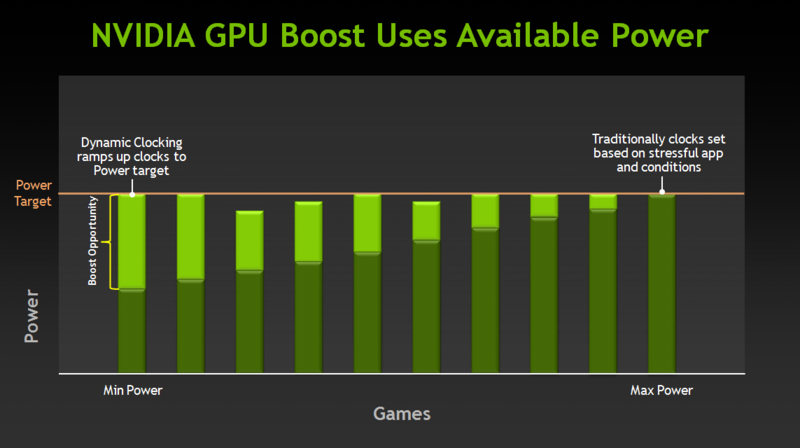 GPU Boost 1.0 enabled GPU owners to direct all available power to game performance for the very first time. Having acquired data from hundreds of thousands of end-users in the year following GPU Boost 1.0’’s introduction, NVIDIA’’s engineers determined that GPU temperature was in fact a more common inhibitor to performance than power consumption. Subsequently, they developed GPU Boost 2.0 for desktop Kepler GPUs, and the latest Kepler notebook GPUs, like the GTX 700M chips we’’re announcing today. With GPU Boost 2.0, Boost Clocks are increased until the GPU hits a Temperature Target set by the notebook manufacturer (notebook Temperature Targets vary depending on the cooling capabilities of each model, and the level of available power). 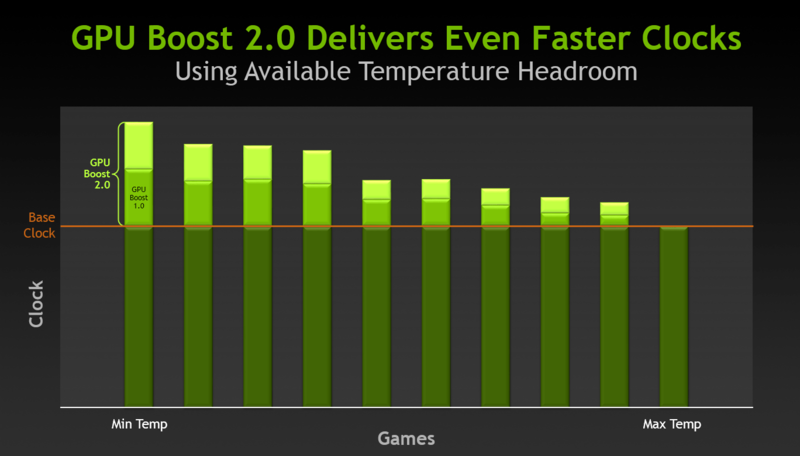 GPU Boost 2.0 increases performance to an even greater extent, compared to GPU Boost 1.0. GPU Boost 2.0 can be found in all GTX 700M-equipped notebooks, and is enabled automatically. While IGPs have historically delivered good battery life, they have consistently failed to deliver the graphics and GPU performance gamers demand. As a result, NVIDIA developed “switchable graphics” technology that allowed notebook users to choose which display adaptor would be used when a NVIDIA GPU was also present. In essence, this technology brought the best of both worlds, offering the battery life of an integrated graphics solution and the performance of a dedicated GPU. Unfortunately, there were limitations to the technology resulting in the end user having to execute a fairly involved procedure to harness the most from the platform, resulting in only 1% of users ever switching between the two graphics systems. With the foundations of a great solution, NVIDIA engineers went back to the drawing board to develop a solution that combined the efficiency improvements of the switchable tech, with the ease of use that the original solution lacked. The product of their labor was Optimus, a fully-automated solution that automatically, instantaneously, and seamlessly optimizes battery life by dynamically switching between the IGP and dedicated NVIDIA GPU. Optimus continually monitors the applications and games being used, and when it detects a program that in some way benefits from a dedicated GPU, the NVIDIA notebook GPU is powered up. Immediately after the application or game is closed, Optimus powers down the dedicated GPU and seamlessly switches the display back to the GPU, without flickering or resetting the system. This automated solution gives notebook users maximum battery life when browsing the web, and maximum performance when saving the day in Metro: Last Light. It’’s a solution that ‘just works’, without the need for new profiles, and for that reason Optimus is now found in over 90% of available GeForce GTX-powered notebooks. 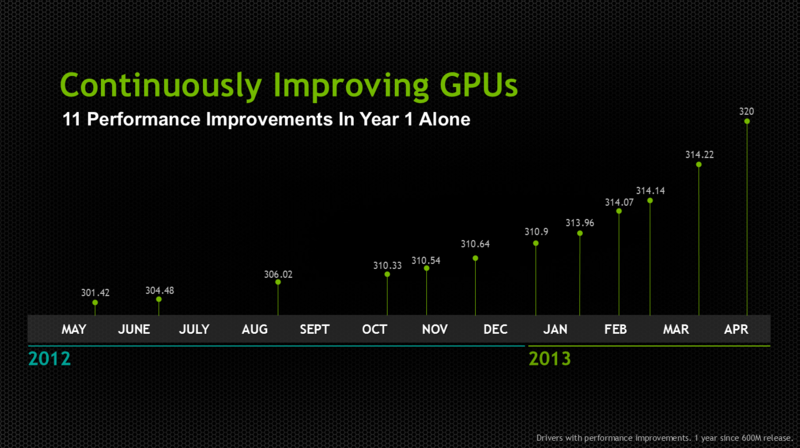 On average, NVIDIA releases at least one new driver per month. Each is released simultaneously for all notebook and desktop GPUs, and in most cases includes performance optimizations, day-zero enhancements for brand new games, and the latest SLI profiles for multi-GPU users. 2013 has seen us continue this trend, with day zero and day one support for BioShock Infinite, Call of Juarez: Gunslinger, Crysis 3 Open Beta, Crysis 3 Retail, Dead Island: Riptide, DmC: Devil May Cry, Dungeons & Dragons: Neverwinter, Far Cry 3: Blood Dragon, GRID 2, Hawken, Metro: Last Light, Remember Me, Resident Evil 6, SimCity, Sniper Elite: Nazi Zombie Army, StarCraft II: Heart of the Swarm, Star Trek: The Videogame, and Warframe. In addition to the above, we’’ve increased performance in dozens of titles, and introduced new SLI and 3D Vision profiles for even more. And should something go wrong, we’’ve got support forums, feedback forms, and the Disqus threads here on GeForce.com, which are constantly monitored following a driver’’s release, ensuring any issues are tackled immediately. GeForce Experience is NVIDIA’s new application that can automatically keep GPU drivers up to date, and can optimize game settings with a single click, simplifying the process of getting the most from your PC, and from your games. Great for those who want to spend time gaming, not tweaking, GeForce Experience recommends the best possible settings for your specific system configuration, allowing you to jump straight into a game without having to change options, drag sliders, or pick between one of eight similarly-named settings in an acronym-laced dropdown. GeForce Experience’’s recommended game settings are based on the speed of your CPU and GPU, and are designed to keep you gaming at a fluid frame rate even in the most demanding, action-packed moments of a game. Last week, we launched GeForce Experience 1.5 as part of the GeForce 320.18 WHQL driver. v1.5 supports over 80 of the most popular English and Chinese titles, improves support for multiple system configurations and resolutions, and can tell you whether your system supports NVIDIA Shield PC game streaming. GeForce Experience 1.5 simplifies your life, too, notifying you of new driver releases and downloading them automatically should you so desire. This feature can also automatically download GeForce Experience support for entirely new titles, as well as new SLI and 3D Vision profiles, ensuring you receive the optimum experience whenever you load up a game. To get started with GeForce Experience, download the new 320.18 WHQL drivers, or the standaloneGeForce Experience installer.